This BMW Performance Electronic Steering Wheel adds a race-inspired style to the interior of the F30 BMW 3-series. Average fuel economy and average speed. Fuel efficiency shift points via LED shift lights and Efficient Dynamics Index (EDI) calculation. G-Force meter for longitudinal and lateral acceleration. 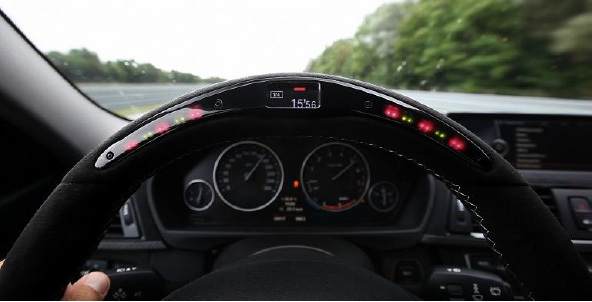 Water and oil temperature and multicolored LED (red & green) shift lights for optimal performance. Stopwatch with storage of values of up to 50 lap times (lap time, max speed, max G-Force). Measurement of up to 9 section times within each lap. 1/4 mile race settings ("XMAS" Tree LED light countdown, reaction time, 60' time, 330' time, 1,000' time, 1/8 and 1/4 mile times and trap speeds). The heating steering function is no longer active after installation. 1. Basic Steering Wheel: The connection cable, vibration generator and electronics for lane departure warning (SA5AD) can be carried over. The airbag unit and the multifunctional keys cannot be reused and must be ordered new. 2. Sport Steering Wheel: (Option code 255) - all parts can be carried over. 3. M Sport Steering Wheel: (Option code 710) - all parts including the airbag unit, multifunction keys, connection cable and the shift paddles for the Sport automatic gearboxes (SA2TB), vibration generator and electronics for lane departure warning (SA5AD) must be ordered new and installed accordingly. An optional infrared transmitter/receiver is also available to automatically and accurately record lap times. This transmitter/receiver is not approved for street use. Please advise that if the infrared option damages the vehicle in any way, may void all or portions of the factory warranty.